Well folks, it has been one wild, crazy roller coaster weekend weather-wise here in Toronto. Now, I’m not going to lie, we managed to go out a few times during the recent ice storm, which was most likely a stupid thing to do. On Sunday, the storm turned quite nasty and I found myself stuck indoors. So, besides binge watching Netflix, what’s the next thing you do? I opened my fridge to forage around and figure out what I could create. As usual, I came across two dead bananas staring me right in the face. PERFECT! 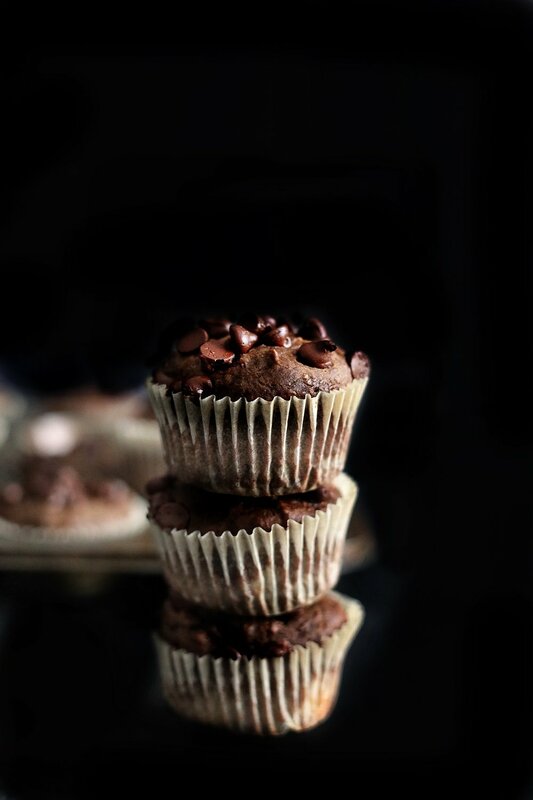 Next, I scrounged around looking for other ingredients in my pantry and came across some raspberry applesauce and enough chocolate chips to throw into this muffin recipe. Question? Do you need to use raspberry applesauce? NO. You can 100% use unsweetened plain applesauce or if you don’t have any on hand, double the yogurt or use oil instead. I also have a feeling I should stop talking, because most of you have already skipped to the recipe. Let me just conclude by letting you know that my neighbour, who lives across the street, (Janet this is for you) was the only one brave enough to don her winter gear and come by to grab some muffins while they were fresh. Good move Janet, good move. 1. Preheat oven to 350F. 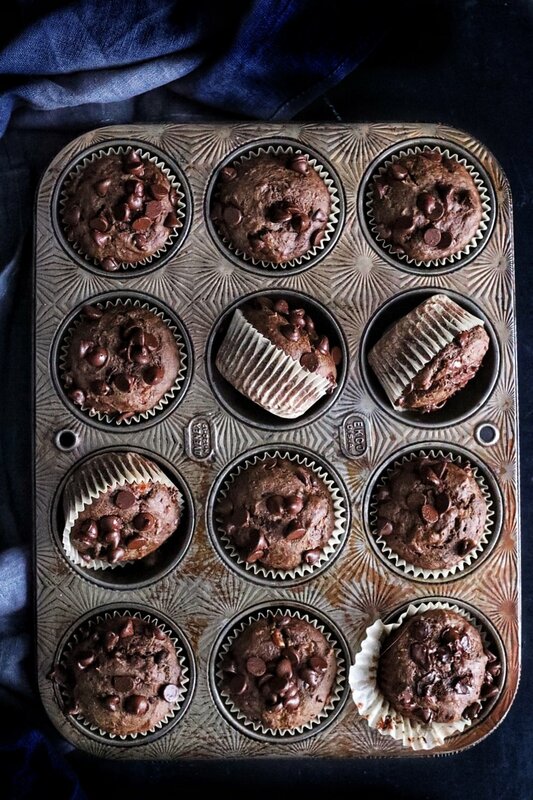 Prepare a 12 cup muffin tin lined with paper cups. 2. In a medium size bowl, mash bananas well and add sugars, applesauce, milk, vinegar and yogurt. Blend well. 3. In another bowl, mix flour, baking soda, salt and cocoa powder. Add dry ingredients to wet ingredients and mix just until incorporated. Do not over mix. 4. Add in half a cup of the chocolate chips and mix again just until the chips are distributed evenly. Using an ice cream scoop, divide batter into 12 muffin cups equally. Top with remaining chocolate chips. 5. Bake for 22-25 minutes or until done when tested with a toothpick. Serve either warm or at room temperature. Let's have a spring fling shall we? !